My son Peter is another of my best works. 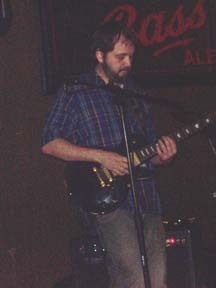 Here, he is performing for the band, Dailey Soul, at an establishment in Charlotte, NC. He plays in several bands and teaches guitar lessons. His major in Music and minor in Philosophy from UNC Asheville serve him daily as he is a guitar virtuoso and an avid participant in debates with his father and friends on many varied subjects. ~ by Sandra Lynn Gray on July 8, 2007.